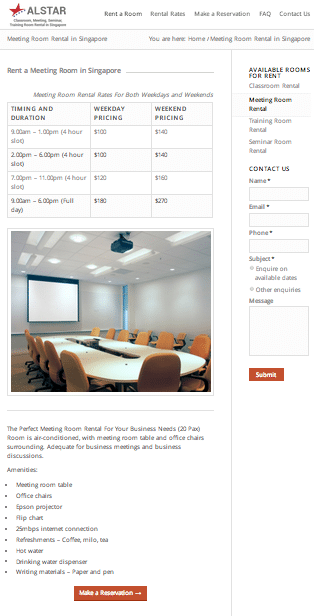 About a week ago, a friend of mine challenged me to create a 10-page training room rental catalogue website from scratch in a day. So why did I value it at SGD$1,500? I took the rate Singaporean web design companies charge – approximately $150 per page for a standard 10-page corporate website and did the math. Based on my experience and having created dozens of websites over the years, some of which never took off, and some of which became really successful, this was extremely possible. But not without proper planning and execution. In this article, I will reveal the step-by-step process from conducting keyword research, setting up a domain name and hosting account, designing site architecture, developing content, to launching a chic-looking catalogue website in just one day – If you’re new to all of this though, I’m sorry to break it to you but you probably won’t be able to finish a fully furnished catalogue website in a day. But who knows, you might just prove me wrong! Why should keyword research be the first step? First and foremost, understanding what keyword search terms are being entered into search engines by your target market will give you both a marketer and user perspective when creating your website. It is also the foundation to creating both a well laid out site navigation and search engine optimized content. The initial keyword research process (using the Google Keyword Planner Tool) usually doesn’t take up more than 2 hours for a 10-page website. You typically want to gather keywords that have moderate to high monthly search volume. Through my experience advertising on Google AdWords, I’ve seen conversions from keywords that have as low as 40 monthly searches. Those keywords are usually long-tail though (2 or more words). Once you’ve gathered a list of keyword variations and synonyms you think you can potentially rank for, it’s time to think of a catchy, brand-able domain name. After roughly just 10 minutes of brain storming I decided on… Alstar Rental! Brainstorming a pleasant-sounding brand name could take me weeks at a time but I got rather lucky this time round. Okay so the first thing I did was a trademark check at the USPTO site and Googled [“alstar” rental] to find any similar sites on the web so I could avoid proceeding with my chosen name if it could potentially cause any trademark disputes. Next was a domain name registration at Namecheap and linking up with my existing hosting account with Siteground or Vodien. Step 4: Install a Content Management System (CMS) through your hosting account. Following this, it will take a couple of hours for the name servers to propagate before we can install the CMS (I recommend WordPress as it’s user-friendly and search engine optimized). While waiting for the propagation, let’s go over to the next step. 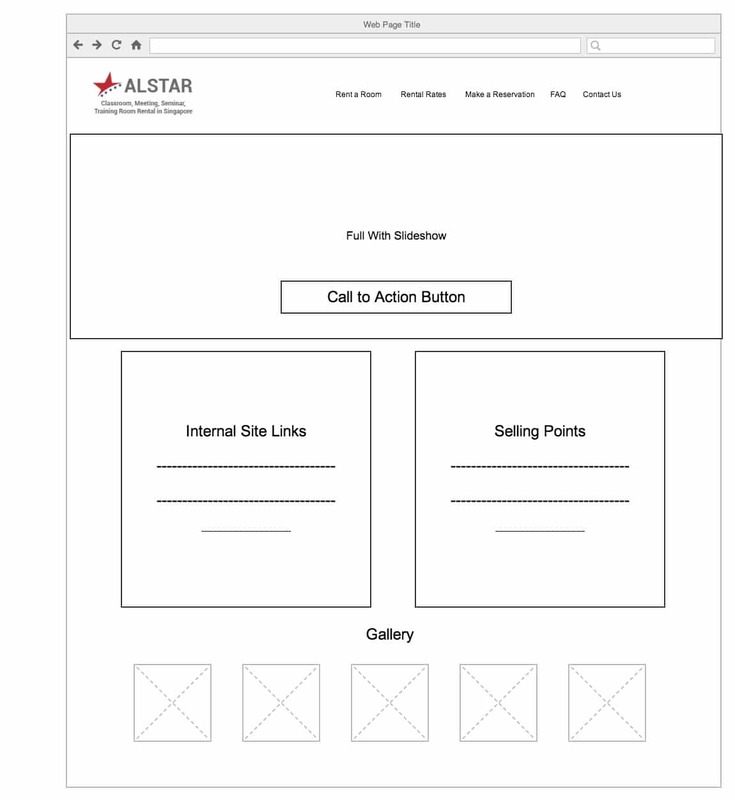 It’s important to have some sort of rough idea what your site navigation structure will look like. A good rule of thumb is to adopt a flat site architecture – less than 3 clicks to any page from the home page. This will benefit your site in terms of SEO and user-friendliness. 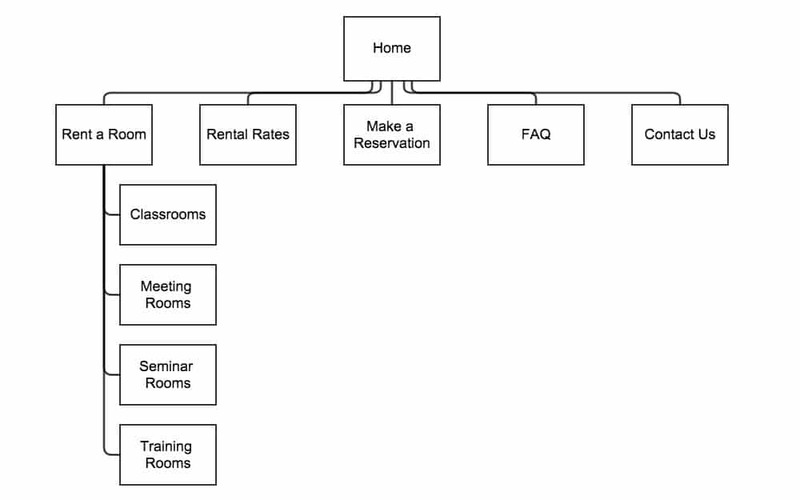 Use a free tool like Gliffy to draft a site information architectural diagram like the example below. This will give you a clearer idea of your site’s design and also serves as a good point of reference. By now, your name servers should have propagated and you may proceed to install WordPress/Drupal/Magento or any of your preferred open source CMSes. I personally recommend WordPress for its search engine friendliness, user-friendly interface, and wide support due to its huge user community base. Once you’ve installed your CMS, the first thing you want to do is install a chic-looking theme/template. You can find great themes for various CMSes at Themeforest.net. Once that’s done, you may proceed to the content development phase. I personally take approximately an hour or less to finish writing 250 words or less, depending on the complexity of the subject topic. For the Alstar Rental project, there were only 5 pages that needed a little copywriting, so it didn’t take me more than 2 hours to finish the copywriting. If writing’s your kryptonite, I recommend these three sites for outsourcing native english writers. 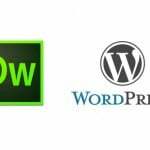 Zerys, Upwork, and Fiverr. Be careful with Fiverr though, you get really cheap articles but most of them lack quality and depth. 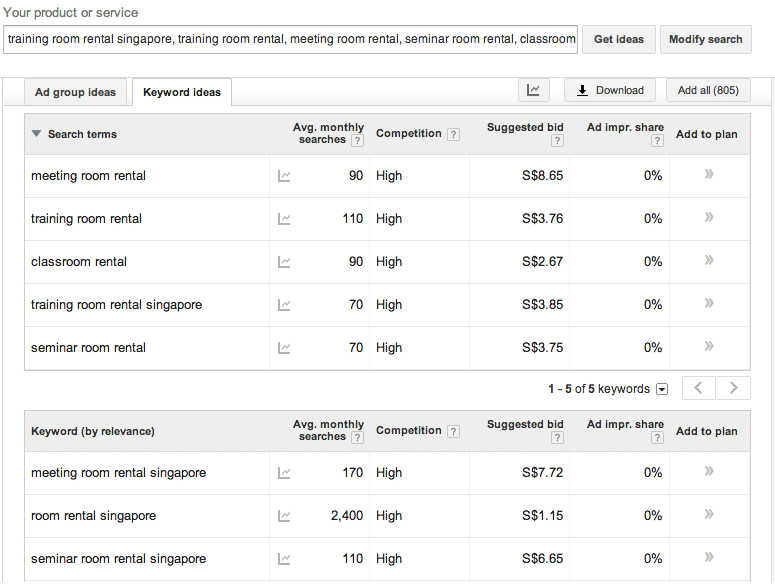 Also, remember to include the keywords you gathered from your keyword research into your content for SEO purposes. I recommend these few sites to get high quality royalty free stock photos. iStockPhoto, 123rf, Shutterstock (paid sites). Freeimages.com and Morguefile.com for free stock photos, expect lesser quality from the free sites however. Multimedia web elements such as HTML5 slideshows, photo galleries, light boxes and more can be purchased as plugins/extensions from sites like CodeCanyon.net. I recommend purchasing the premium plugins as they come with better support, documentation, and step by step tutorials. A basic contact form, application, lead signup form can be easily constructed in 15 minutes or less via a plugin/extension like Gravity Forms or Formidable Pro. Given my experience and familiarity with the WordPress interface, I took an average of 45 minutes to design and complete each webpage. With a total of 10 pages, I took approximately 7.5 hours to finish constructing the pages. Fix any of this errors if you find any, read through your articles thoroughly to check for any inconsistencies in your message, make sure that visitors find a good reason to remain on your site upon landing on each page throughout the visit session and you should be good to go. Overall the project took 10 hours of working time – I started at 9am and ended at around 9pm (12 hours) including lunch, dinner, and short breaks in between. It was a challenging project but worth the time and effort. Oh, and did I mention, I won the bet and my friend had to treat me to my favorite Song Fa Bak Kut Teh at Clarke Quay! 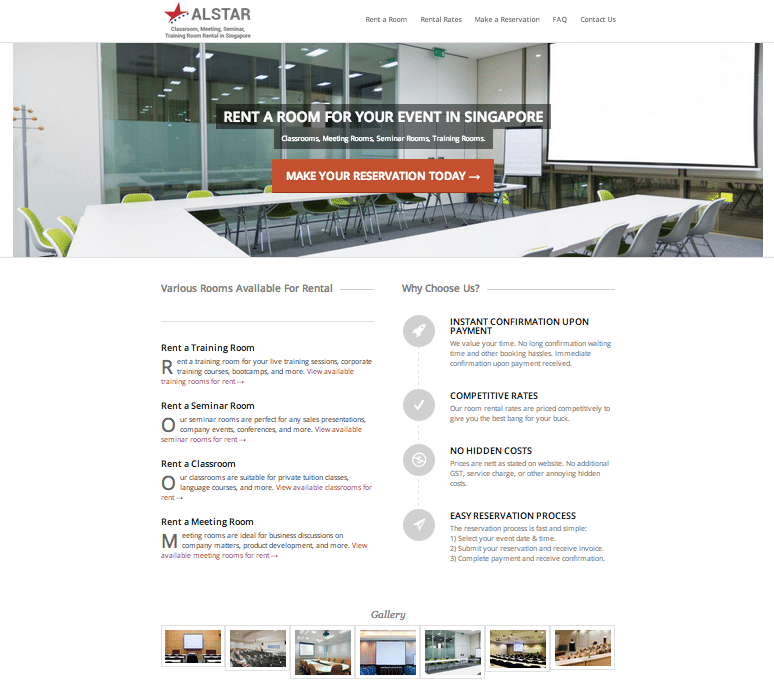 Alstar Rental has been relaunched as VenueSquare.com and is renting out actual training rooms, seminar rooms, and meeting rooms now. If you’d like to learn how to create a professional-looking website that engages and converts your visitors into customers, I suggest checking out our WordPress Website Creation Course. If you already have a website and want to learn how to be more visible on the search engines, you may want to check out our Search Engine Optimization Training Course in Singapore. Dylan Sun is the Founder of Equinet Academy, a SkillsFuture WSQ-Accredited Digital Marketing training organisation. Passionate in all aspects of Digital Marketing and SEO, he extends his passion to helping people implement effective digital strategies to their businesses. 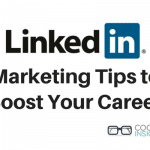 Follow his blog at Equinet Academy to learn more about Digital Marketing. Nice article, it shows knowing what you do well works. Nice website and good tips on web design. My goodness! I wish i had skills like you. For my website, it took me a month! But it was worth it. Thanks for the tips, will definitely try to improve my website with it. Thanks Shawn. Your real estate website looks pretty impressive too! Hope you found it useful, Mok! A nice article with some good tips on website design.